Under siege: The home of Bob and Lyn Green at Conway Beach, near Airlie Beach, inundated by a storm surge during Cyclone Debbie. Photo: Supplied. NORTH Queensland priest Fr Jose Koyickal drove through the debris strewn streets of Proserpine to visit parishioners this morning. Despite the flooding and the property damage, Fr Koyichal said people in Proserpine remain “hopeful” in the wake of Cyclone Debbie, now a downgraded to a tropical low. “We can rebuild our lives, by the grace of God,” he said. Some roof tiles were blown from St Catherine’s church in Proserpine which allowed water to run down the walls into the church. His office also suffered water damage. As a precaution, Fr Koyickal said this Mass will be held at normal times in the parish hall next to the St Catherine’s church. He said it will be several days before its possible to reach parishioners in Airlie Beach, and to inspect St Martin’s church in Cannonvale. Airlie Beach remains cut off, with extensive damage to houses, businesses and with some yachts beached and wrecked. THE emergency response to Cyclone Debbie has begun, clearing downed trees from roads, repairing power lines and damage to homes which have lost rooves. Around 63,000 homes are without power across the Whitsunday region from Mackay to Bowen. Amidst the carnage, a ray of hope – a baby girl is safe and well after being born at Whitsunday Ambulance Station at Cannonvale at 4:20am. And before you ask, her name is Billiana. Among the Catholic communities, Fr Jose Koyickal spent the early hours of March 28 praying for the elderly living in his Whitsunday parish, which includes Proserpine and the tourist-focused Airlie Beach. “I didn’t sleep well last night, I was thinking about so many people,” he said, as the full force of Cyclone Debbie whipped the Whitsunday Coast and flattened sugar cane fields inland. Fr Koyickal said many of the vulnerable in the parish were able to move and stay with family before the storm struck. Safe refuge from slow-moving Category 4 Cyclone Debbie was a top priority. Across a massive region stretching from Mackay to Ayr, 25,000 people were directed to evacuate to higher ground because of the fears of a storm surge. An estimated 10,000 children were kept home from Catholic schools across the region. During the early morning of March 28, Whitsunday Islands were hammered by winds up to 196km/h. 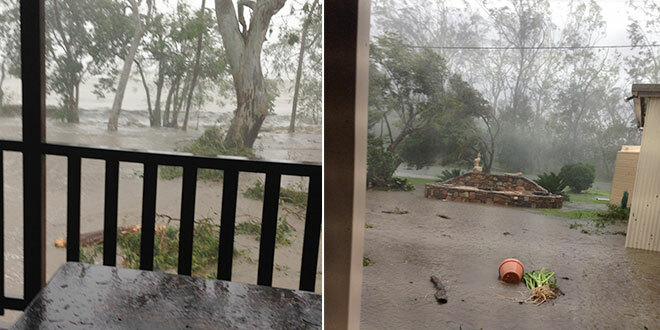 Chrissie Jane Yee, a holidaymaker on Hamilton Island, witnessed the fury of Cyclone Debbie from her apartment overlooking the island resort. The usually pristine resort island was a scene of stripped palms, debris and a raging tidal surge. 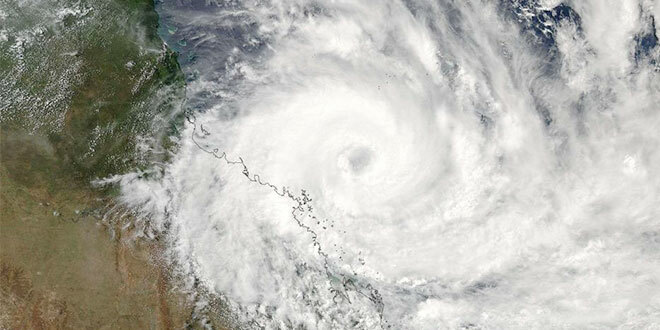 The slow-moving Category 4 cyclone stalled for some hours off the Whitsunday Coast with destructive winds whipping the coast from Mackay to Ayr. From above: An image from video sent from International Space Station revealing the superstorm approaching the Queensland coast. At Conway Beach, just near Airlie Beach, the wind and high tide combined to deluge houses built close to the shore. Bob and Lyn Green watched rising water lap through their downstairs waist-deep, inundating their home and surrounding properties. Police dispatched an urgent message on social media: “#CycloneDebbie starting to make landfall btwn Bowen & Airlie Beach. If winds stop, you are only in Eye. DO NOT GO OUTSIDE”. St Mary’s parishioners in Bowen hunkered down. Trees were downed, buildings shuddered, rooves were lost and debris was seen flying along the main streets. “Everybody’s fine,” parishioner Margaret Price, who lives on a family farm on outskirts of the town and near the Don River, said. She spent nervous hours watching and waiting for the river to rise – a signal that the deluge would have a lasting impact on the region’s rich horticultural industry. Bowen is the largest winter vegetable-growing region in Australia supplying fruit and vegetables to domestic and international markets. Mrs Price said farmers would now be counting the cost of crop losses – tomatoes, capsicum, eggplant, pumpkin, cucumber, beans and corn. “It will be devastating if crops are already in the ground,” she said. The Bowen growing region extends from Mackay to Townsville, and has an annual turnover of more than $450 million a year and employs 3500 seasonal workers. In drought-stricken western Queensland graziers were counting on decent falls in the wake of Cyclone Debbie, as rains extended into inland river catchments. Authorities assessing the damage also looked to the impact on the Great Barrier Reef, half of which was covered by Cyclone Debbie. David Wachenfeld, from the Great Barrier Reef Marine Park, said he expected there would be “a lot of wind and wave damage”.